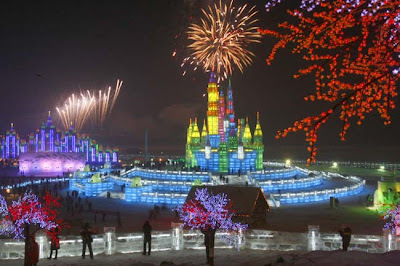 Home World Harbin - China's Winter Wonderland !! Harbin - China's Winter Wonderland !! Just as we're gearing up to spend another cold Chinese New Year with family in Shanghai (and Aussie Pete gets to play with fireworks again), I'm wondering if it will be snowing like it was in 2008. One thing's for sure - further north in Hei Long Jian province, the city of Harbin (also know as Ha Er Bin in pin yin) will be loving the cold weather. The 25th Harbin International Ice and Snow Festival in China has opened with a bang as fireworks and lights ignited, illuminating the city park. 1. Light fantastic ... the annual festival features ice sculptures, while buildings and the surrounding park is decorated in a colourful light show. 2. Show stopper ... a stunning firework show marked the opening of the festival. 3. Lot of bottle ... some of the world's best sculptors have their work displayed in this year's festival. 4. Feeling blue ... the festival illuminates the entire town. 5. Flower power ... a visitor takes a close look at a lit tree during the opening of the Harbin Ice and Snow Festival. 6. Main event ... the festival has been held at Harbin since 1963. 7. Snow queen ... the average temperature in winter is -16 degrees due to cold winds from Siberia. 8. White work ... the freezing weather is ideal for building snow sculptures. 9. Santa sighting ... organisers say the Santa Claus ice sculpture is the biggest in the world. 10. Big gift ... the Santa sculpture stands at 160m tall. 11. Tall order ... workers use rope and ladders to scale the massive snow sculptures. 12. Movie magic ... if you hadn't guessed the event is sponsored by Disney.